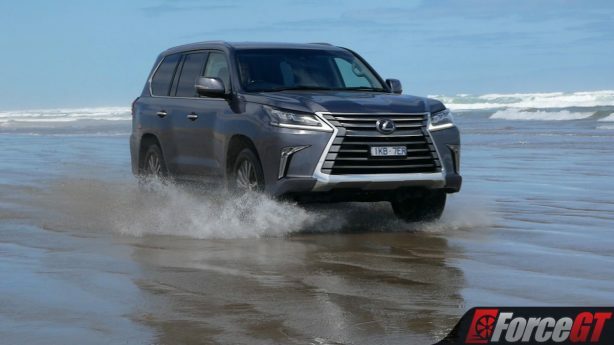 You see, despite more LandCruisers being sold in Australia than any other country in the world, the Lexus LX which is identical under the skin but more luxurious inside hasn’t quite seen the same success. 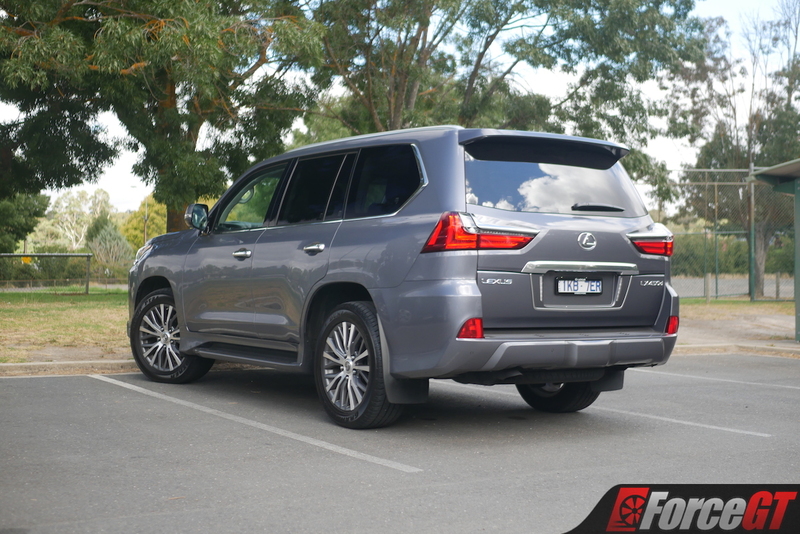 Aimed primarily at the US and Middle East, the LX’s Achilles heel in Australia has always been that it was only offered with a big petrol V8 with an unquenchable thirst, and in a market with petrol as expensive as ours, it was never really going to work out. However, Lexus has been listening and they’ve finally done what they should have from the start, and that’s fitting the LX with a big diesel engine instead that clearly appeals to our market through its success in the LC200. Dubbed the LX 450d, the choice of engine isn’t the only thing that has been changed, with a number of other alterations – both for better and for worse – to be found throughout, so to see if the diesel does the trick, and to put it through its paces off-road to see if it’s really a proper off-roader and not just a blingy SUV for city-slickers, we grabbed the keys to one in order to find out. 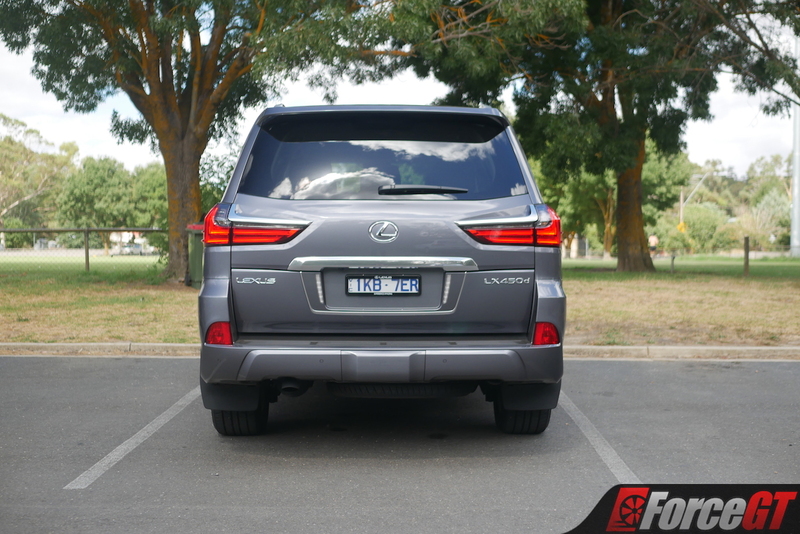 Right off the bat, there are no real visual cues as to the difference in its underpinnings, as the same bold styling seen on the petrol-powered LX 570 is all there. Whether you like it or not is obviously a personal preference, and I can’t say I’m particularly enamoured by the Predator-esque face it has tacked onto its otherwise boxy and traditional bodywork, but I’m certainly not offended by the way it looks. 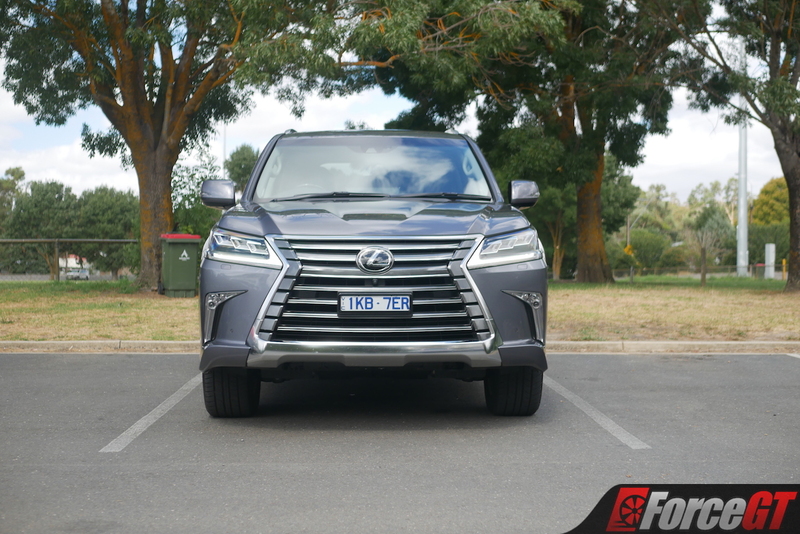 But while it might not look any different to the petrol-powered LX 570 on the outside, there are some differences to be spotted on the inside, although they aren’t necessarily positives. 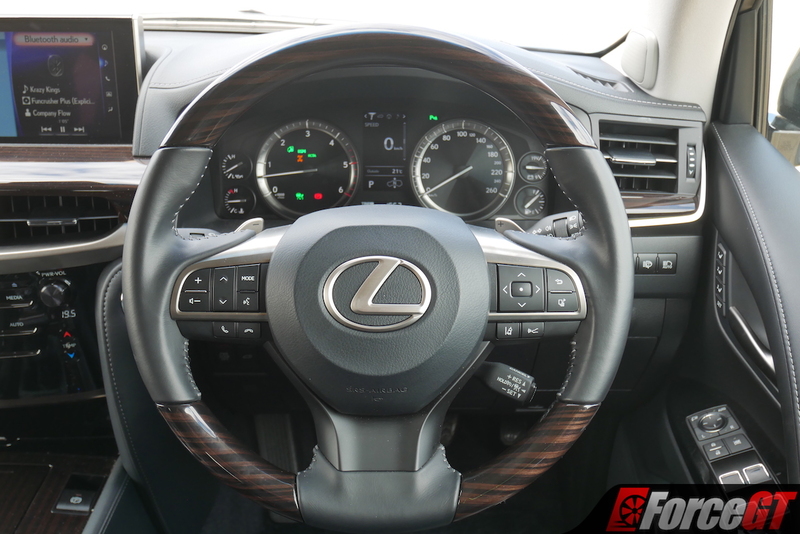 Thankfully, all of the high-quality materials you’d expect to find in a Lexus remain, meaning plenty of wood-grain trim; incredibly soft, high-quality leather upholstery; and particularly thick and plush carpet. 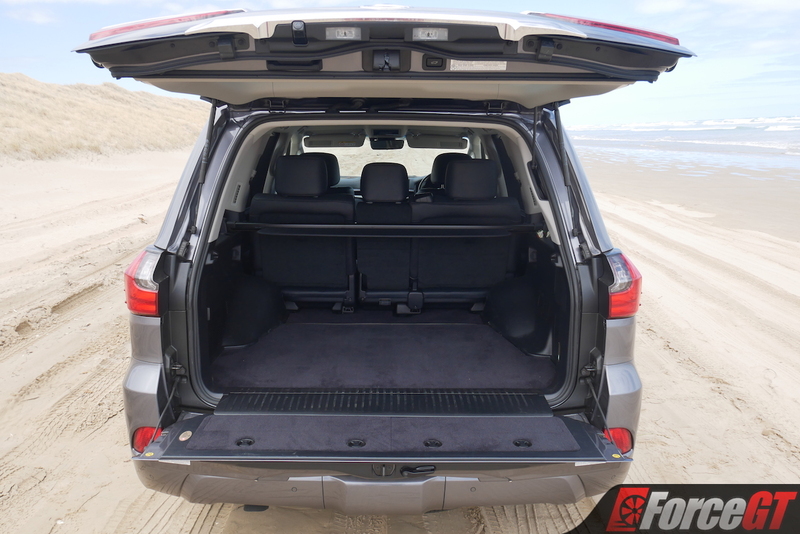 The absolutely massive boot also remains – with a whopping 909 litres of cargo capacity with all seats in place – as does the palatial amount of cabin space and very comfortable and supportive seats… except, there are now only five of them, as opposed to the eight of the LX 570. Why? Well it’s the same reason that explains a few other missing items – weight reduction. With the new diesel engine being a heavier unit, a few items have been forced to go AWOL in order to not exceed the vehicle’s GVM too easily. 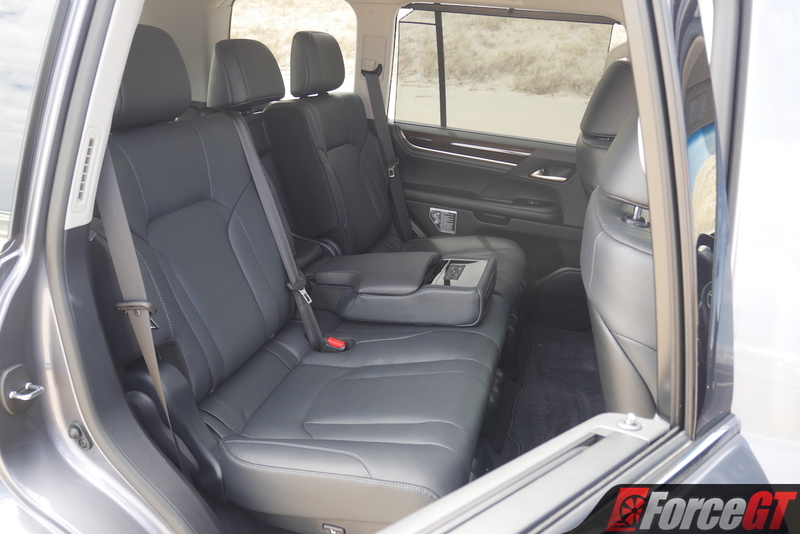 As such, the rear seat entertainment system, 19-speaker Mark Levinson sound system, sunroof, front-seat ventilation, and the previously-mentioned third-row seats are now all gone. Don’t think it’s now under-equipped for a second, however, as there’s still plenty of kit to be found. 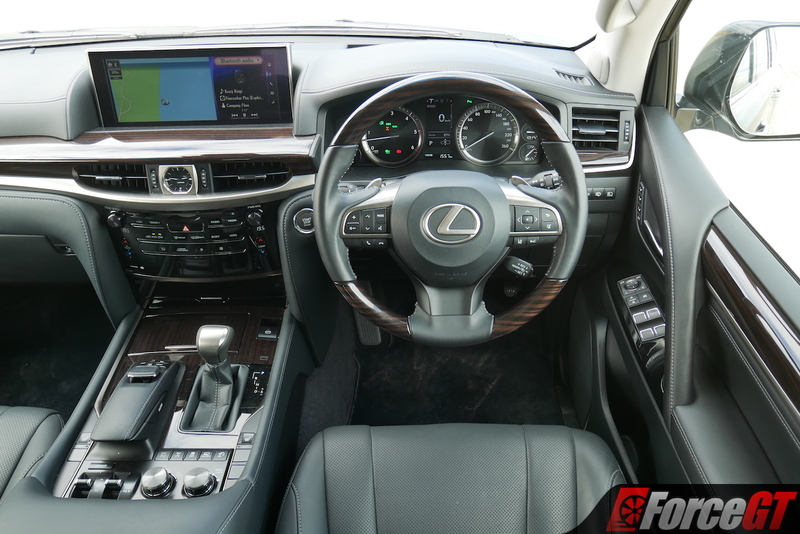 Heated front seats, a head-up display, a massive 12.3-inch infotainment screen (controlled by the admittedly annoying Remote Touch Controller that Lexus is now moving away from), unbranded 9-speaker stereo, and a 360-degree camera are all standard. 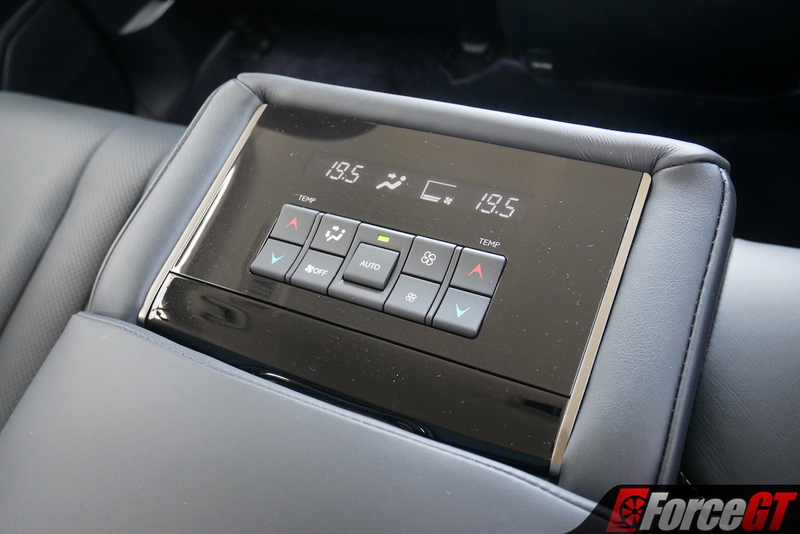 There’s even a cool box in the centre console, although as the one in our tester was stained and smelt like dog food and I didn’t exactly feel like cleaning up another journo’s mess, it was the one feature that went unused for the week. In fact, everything you see is standard as there are, in typical Lexus fashion, no optional extras for the LX 450d, with it simply coming in this sole, fully-loaded specification. 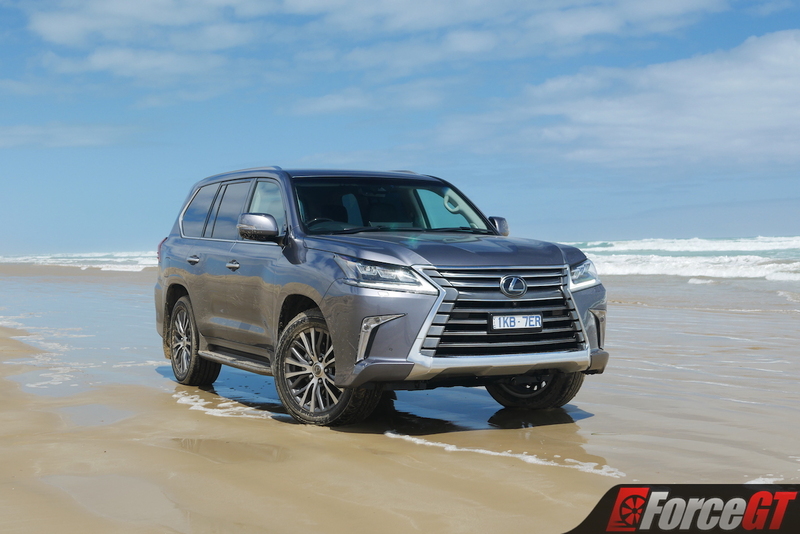 But obviously, the big-ticket item here that sets the LX 450d apart from the 570 is its diesel engine, and it’s one that feels long overdue to have made its way into the LX, having been available in the LandCruiser since launch. 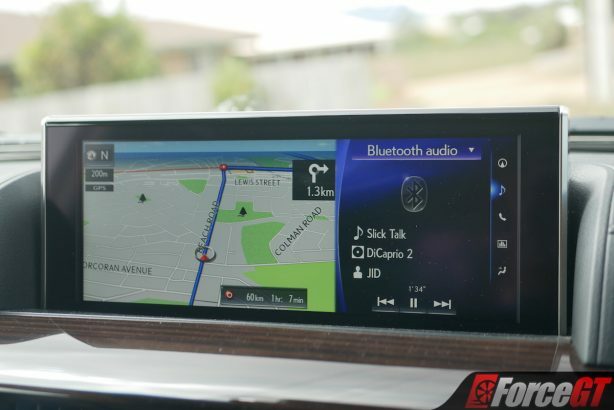 It’s a big beast – a 4.5-litre twin-turbocharged V8 known in Toyota-speak as the 1VD-FTV with a hefty 200kW and 650Nm on tap, the latter of which is at your disposal between 1,600-2,800rpm. 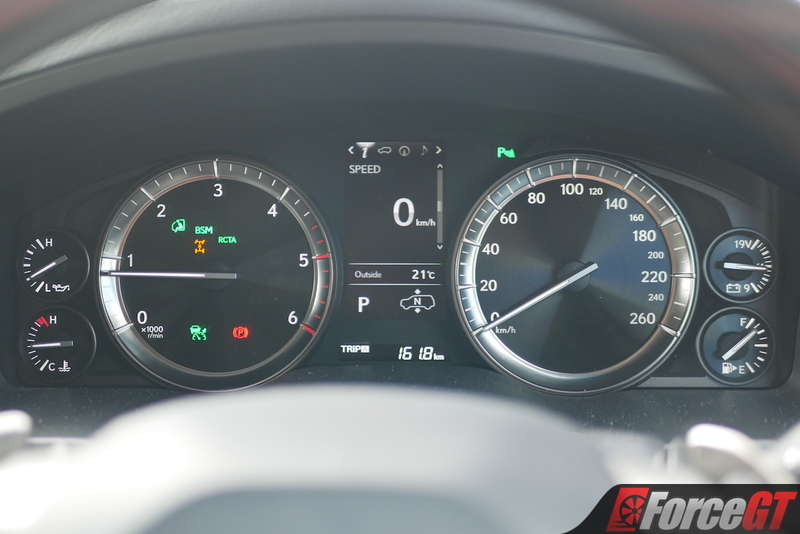 You should see far better fuel economy with the diesel, with a claimed average of 9.5L/100km compared to the petrol’s 14.4L/100km. 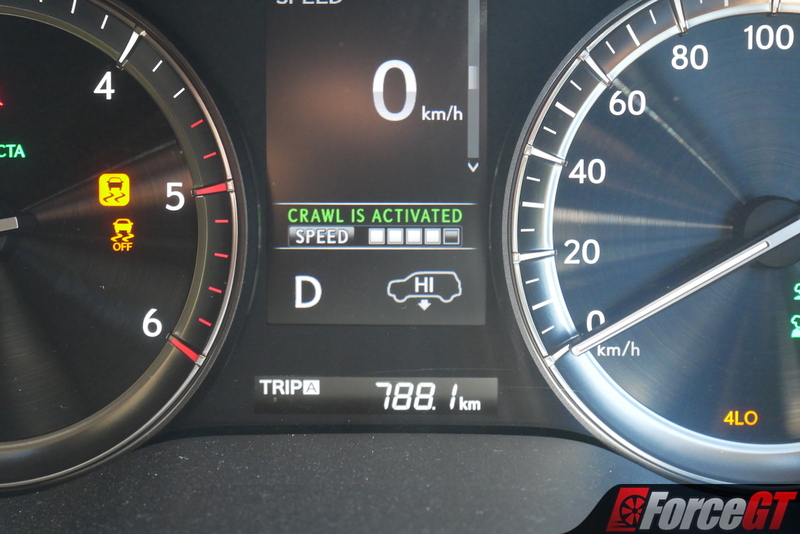 In reality, we saw exact usage of 13.1L/100km after brimming the tank. Rather curiously, it’s also worth noting that it loses the petrol’s 138 litre dual fuel tanks, instead only offering a single 93 litre tank. Unlike its petrol equivalent, it’s paired to a lesser six-speed automatic transmission, although it still sports the same full-time four-wheel drive running gear with high and low ratios, and a locking centre differential. The big oiler might be getting on in years, but you can’t tell that from behind the wheel. It’s truly one of the most refined diesel engines on the market, with incredibly smooth and predictable power delivery, and it never gets too vocal about it at all, although what noise it makes does sound pretty good. It’s an absolute gem of a thing. 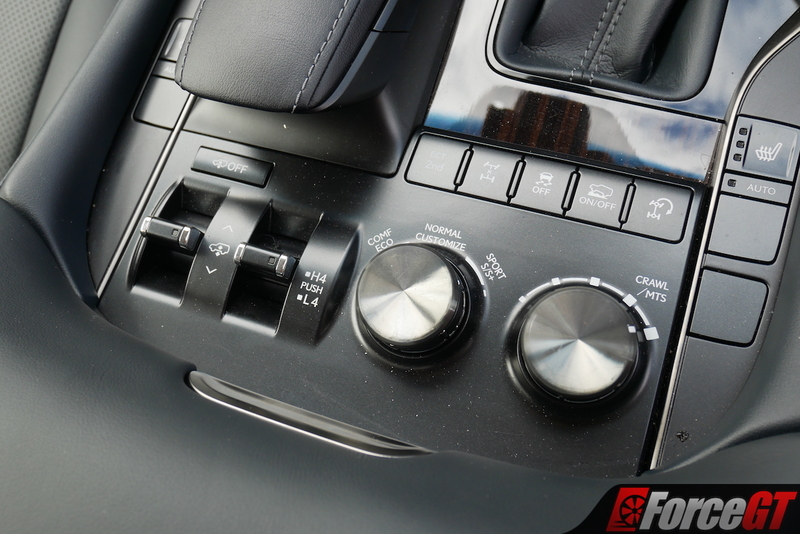 It’s pairing with the six-speed slushbox isn’t a bad one, either, as it compliments the smoothness of the big V8 with its dulled shifts, while when you’re really pedalling it, it will simply slip the torque converter and allow you to keep it right in its happy place during acceleration at around 3,000rpm. But with what we’re here to talk about being its off-road performance, its hard to ignore the prowess of its full-time four-wheel drive system, and the many, many gadgets it has on offer. Now obviously, all the stuff you’d expect like a dual-range transfer box and a locking centre differential is all there, but it also has hill descent control, crawl control with five selectable speeds, the Multi-Terrain Select traction control system, the Multi-Terrain Monitor system that uses four cameras around the car to provide a better view of where the wheels and bumper are positioned, and a particularly clever feature called Off-Road Turn Assist. What this unique system does is lock up the rear inside wheel during tight turning manoeuvres to drastically reduce the LX’s turning circle by almost half what it normally is. As you can see from the picture below, it certainly does the trick and makes turns that wouldn’t normally be possible in a five-metre long vehicle possible. 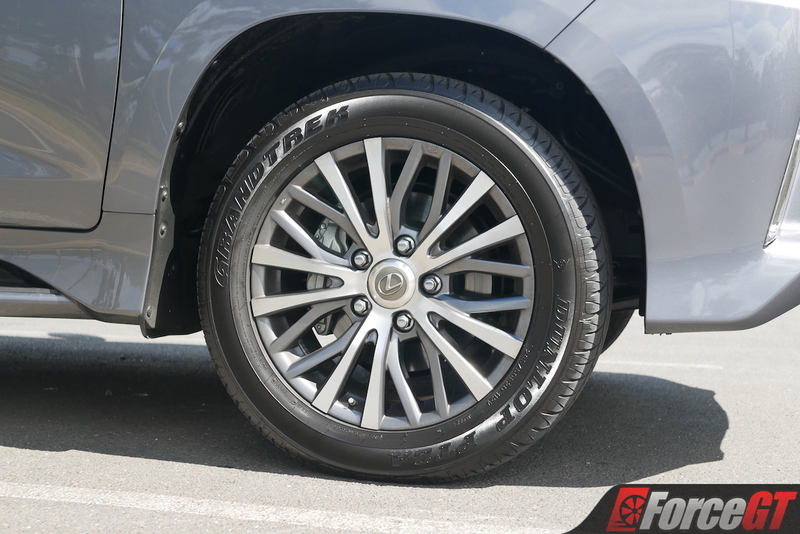 Furthermore, it also has height-adjustable hydraulic suspension, which not only makes it more capable by increasing the ride height off-road, but helps it ride smoothly on all surfaces – sealed or unsealed. 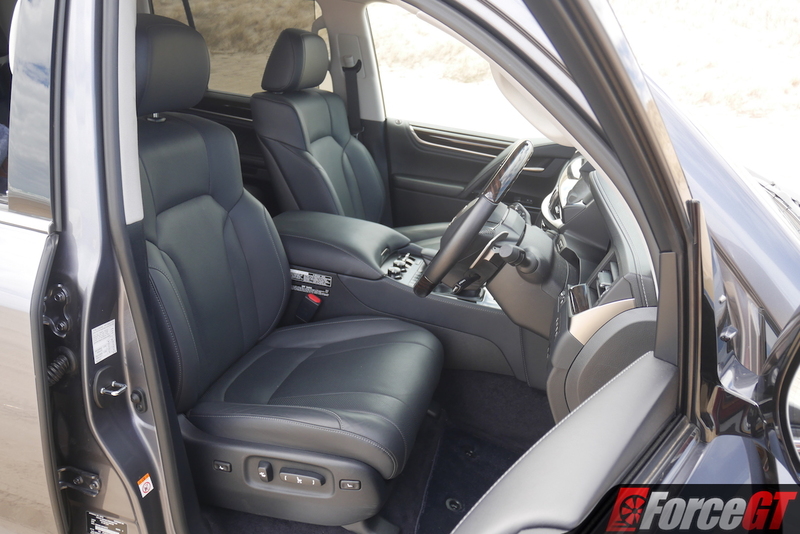 And the way it rides so smoothly and comfortably is a big selling point for a rugged, body-on-frame SUV such as this. 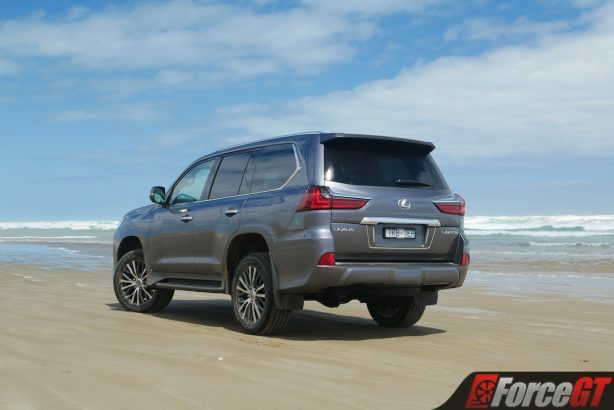 Around town, on the open road, and on any rough or corrugated you’d encounter off-road, it remains nice and level and never throws you or your passengers around. It’s not perfect in urban environments, however, as it’s somewhat cumbersome due to its slow steering and tendency to lean through the bends. There isn’t a truly excessive amount of body roll, but it won’t let you forget that it weighs the better part of three tonnes. 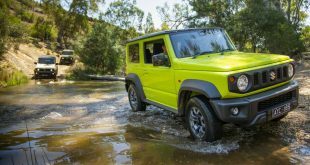 And that, ultimately, is because it doesn’t – this thing is a bonafide off-roader through and through, and the moment you hit the gravel that much becomes clear. 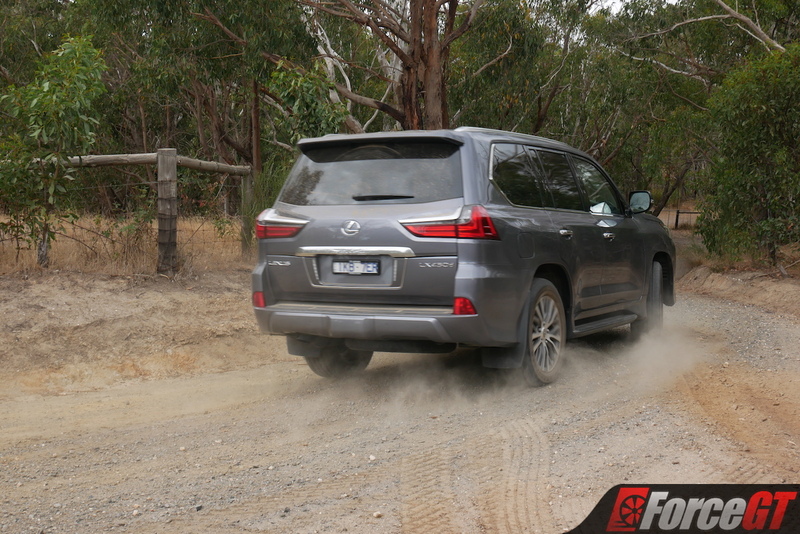 On fine, loose gravel, it’s incredibly tractable – so much so that even on road-biased tyres, it makes gravel roads feel as though they’re sealed. 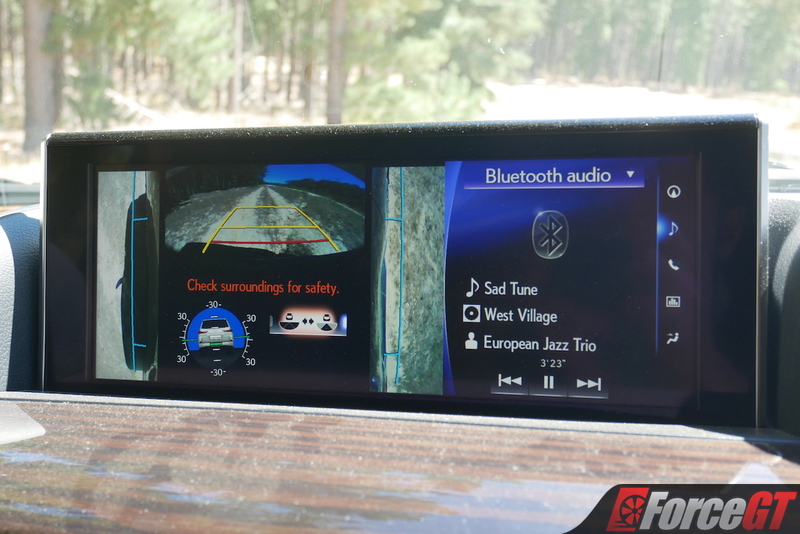 The only other car I can think of that comes close to feeling this secure on gravel at high speed is the Subaru WRX STI – a car with long and storied rallying history behind it, so it’s high praise for me to give. 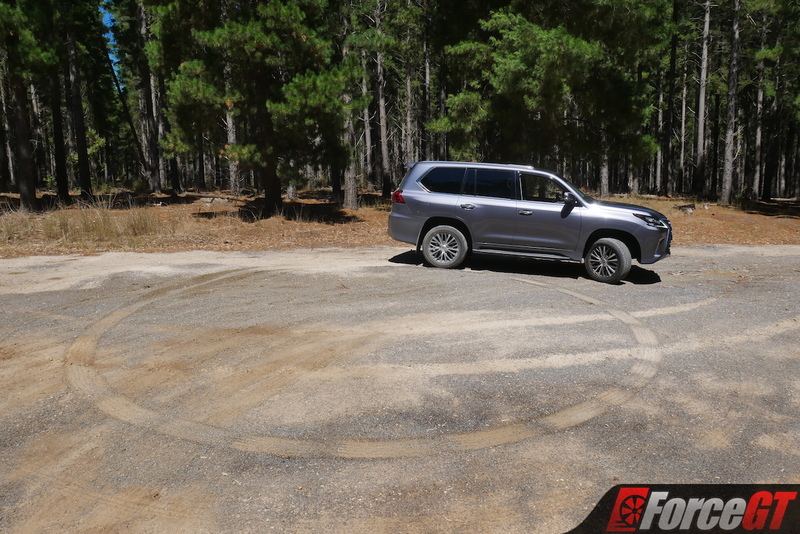 But even on particularly challenging surfaces like fine, dry sand it makes it all seem easy – simply lock the centre diff if it feels a little loose, and you’ll get through anything you throw it at. It doesn’t seem to struggle in water either, although the most water we could find was on a trip to the beach where we took it for a little splash, as with the intensely hot summer we’ve just had in Australia there wasn’t a drop of water to be found anywhere else. There’s a good amount of suspension travel on offer which, combined with its decent 225mm minimum ground clearance means that it’s not too much of a challenge traversing any challenging terrain. 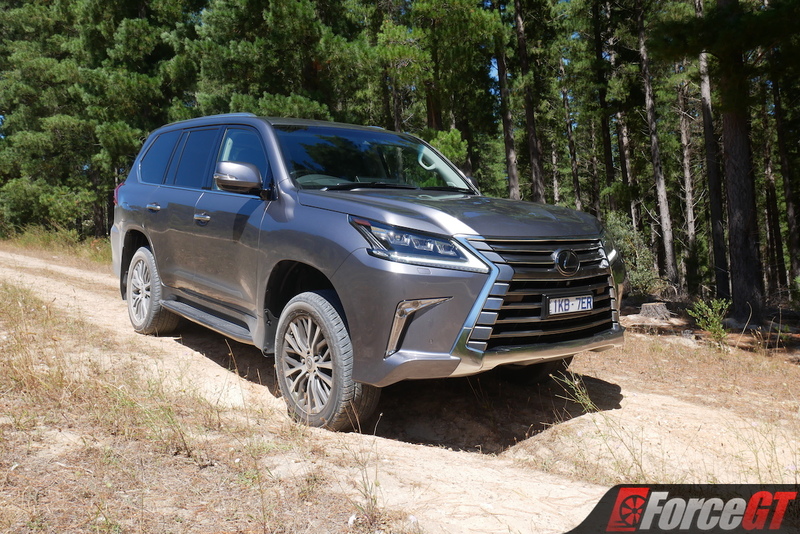 However, I can’t say it’s entirely a walk in the park as all LXs present one great disadvantage over the 200-series LandCruiser – the styling. And no, it’s not just because it’s not as handsome, but because the different front and rear bumpers reduce its approach angle to 25 degrees, and its departure angle to just 20 degrees. Although we didn’t end up inflicting any damage on either end, we did witness it coming a little bit too close for comfort at some points, so it’s definitely something to consider if you’re planning on bush-bashing on a regular basis. 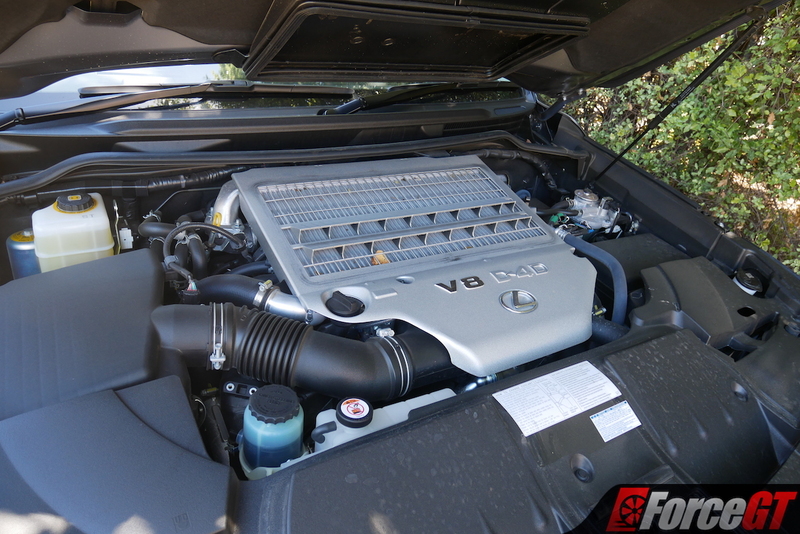 But the one thing that stands out most about the LX now is – you guessed it – that glorious diesel V8. With its beefy 650Nm of torque available so low in the rev range, you never have to worry about manually selecting gears or running out of grunt when you’re off-roading – simply let it slip the torque converter and it has enough pulling power to get you through, up, or over anything. 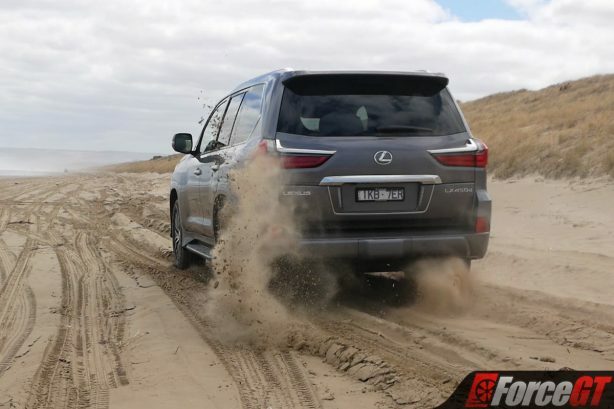 And if what power that’s on offer isn’t enough for you, there are plenty of aftermarket options at your disposal, and living in an area where the standard LandCruiser is particularly popular, I know of a few people getting very good performance out of these engines. But with that said, I don’t feel it would be necessary to squeeze any more out of this engine as it’s plenty powerful and well-calibrated from the factory, with such a long peak torque plateau and a linear and progressive power band that helps it feel very refined. 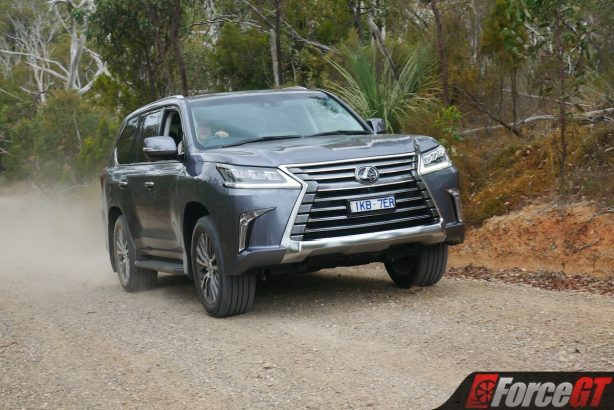 All-in-all, it’s a very good off-road performer, the LX 450d, but with that engine, driveline, and sophisticated tech, you’d expect it to be. 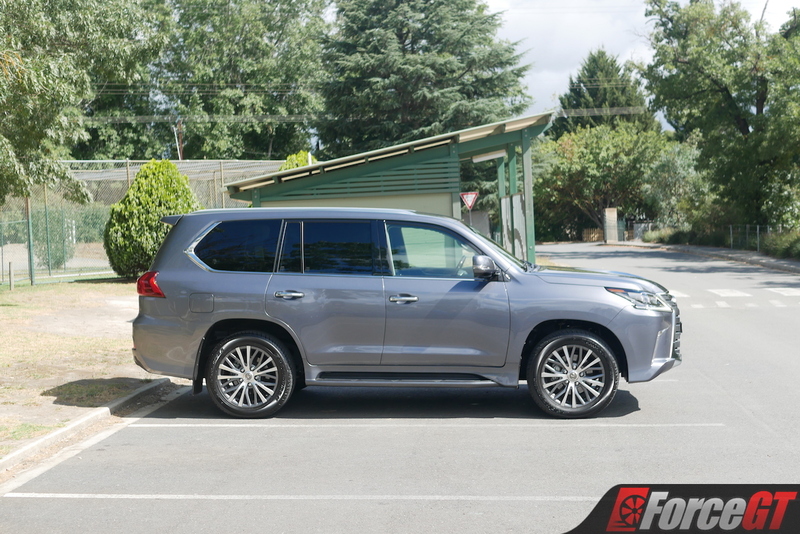 With some clearance penalties due to its styling features, it perhaps makes more sense on the open road – where it’s a quiet, comfortable, and relaxed cruiser – than roughing it up, even though it certainly can. 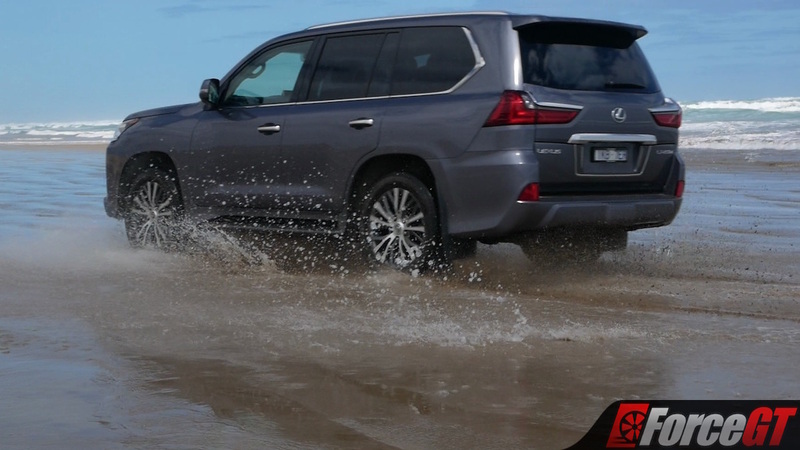 With the addition of the fantastic twin-turbo V8 diesel engine to a car that already had a capable four-wheel drive system and some very sophisticated off-roading tech, the LX 450d is a vehicle that feels unquestionably capable on any surface you could throw it at. 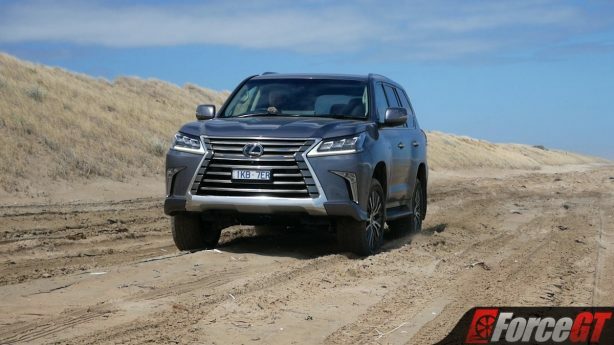 However, the clearance penalties it’s hampered by due to its admittedly questionable styling means that it’s not quite as able to conquer particularly challenging terrain, even though its drivetrain could certainly get it through it otherwise. 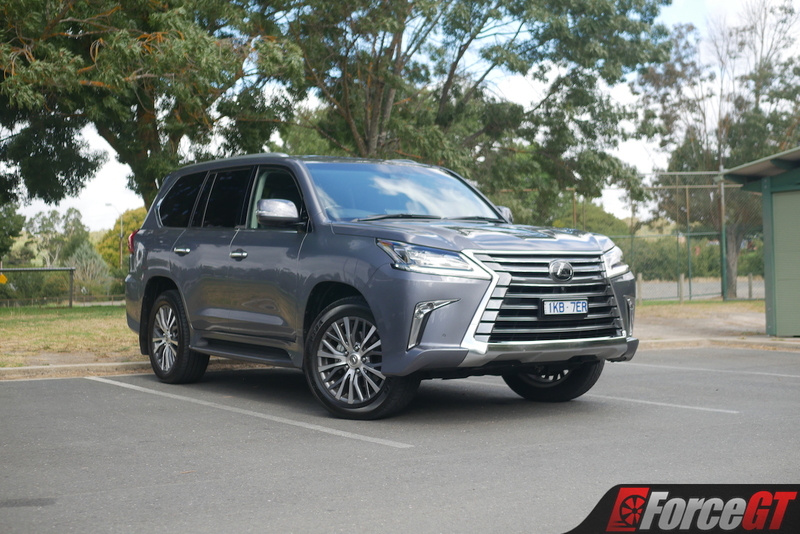 It’s a shame that it loses a lot of kit that the LX 570 comes with as well, although we can certainly understand why dropping a few kilos was required, and it does make it a lot cheaper. 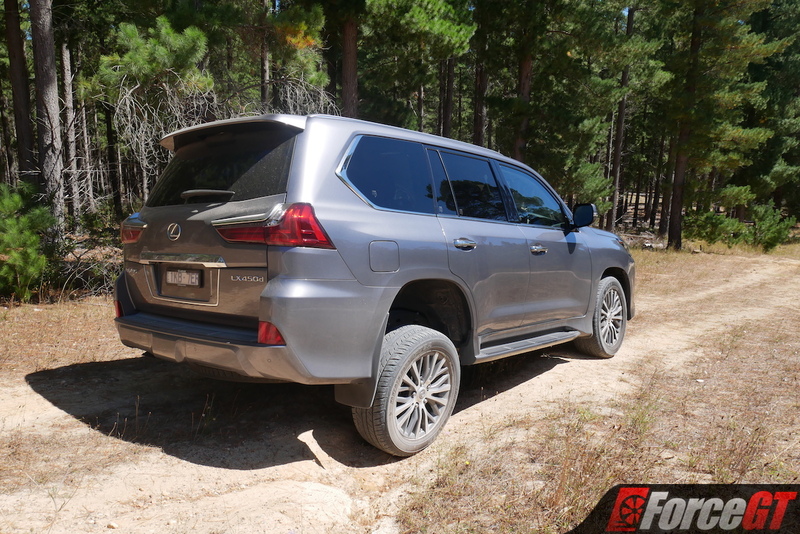 Ultimately, the Toyota LandCruiser is going to be the better bet if you’re really planning on hitting challenging terrain on a regular basis, while the plusher Lexus is more at home on the open road.